What you think about the Cards this year Stink? Yeah, what about the Cards? I have to decide if I'm going buy a TV package or not. This Tuesday (Feb. 5), Trump will hold the State of the Union Address. Will Ginsburg be there? If not, what will the libs throw out as an excuse? Also, what should Trump say about her absence and the future of the court if she is still missing? That would be a huge mistake. Having a conservative justice to replace RBG is more important than the wall. I actually proposed that he do something like this back when he nominated Gorsuch, name a moderate to replace the first left winger to go, in exchange for agreement by democrats to behave reasonably and let nominations go forward on merit instead of picking fights over single issue positions. But after Gorsuch and Kavanaugh, democrats obviously have no interest in behaving reasonably. If only the republican congressional leaders hadn't been a bunch of milquetoast wusses for the last decade. (02-01-2019 02:23 PM)Claw Wrote: It's a judgment call. How many days has it been now since RBG has made an appearance? (02-02-2019 06:58 PM)Side Show Joe Wrote: How many days has it been now since RBG has made an appearance? It just amazing me how people on the left, even those on this board, just ignore the topic. They just don't want to have any type of discussion about what is going on. Keep it front and center CP. (02-03-2019 08:55 PM)Side Show Joe Wrote: It just amazes me how people on the left, even those on this board, just ignore the topic. They just don't want to have any type of discussion about what is going on. Well, it is kind of morbid, is it not? Of course she is near the end of her life. She’ll die when it’s time. No need to rush it. It is not about her. It is about the magnitude of the entire story of her absence, and the mainstream media and Washington's refusal to acknowledge or report on it. When a subject this big is obviously being suppressed, and there is no transparency, it becomes a concern for the integrity of the court. Is she doing her job from home, or are others taking on her duties? If she can make an appearance, than she needs to. If she isn't recovering from her surgery by now, she needs to consider what will be best for her health, and at least recuse herself from the current cases before the court. As I said earlier in the week, we had 8 SC justices on the court for about 13-14 months after Scalia died. I didn't see anyone here too worked up about that on the right end of the political spectrum. That's 60 days compared to 400 days. Find one of those right wing conspiracy nuts and have them case out her DC home. I would think you'd be able to find out pretty quickly by bribing a maid or nurse to see if she is alive, in a coma, or dead. BTW, according to the official word from the Supreme Court, Ginsburg is at home recovering and still weighing in on cases from her home office. I'm not sure how anyone here can complain about that (as long as it is true) because President Trump in a new report spends 60 percent of his days in the White House (since the Midterm Elections) in 'Executive Time' (which is a nice name which means basically spending his time in whatever office or room he feels like where he can watch Fox News or other TV shows, read papers, and make an occasional phone call. Since Nov. 7, the day after the midterm elections, Trump has spent around 297 hours in Executive Time, and for those same schedules, Trump has had about 77 hours scheduled for meetings that include policy planning, legislative strategy and video recordings. There is a big difference in the two situations. Everyone knew where Scalia. He was not attempting to decide cases before the court. Ginsburg is legally alive and missing!!! 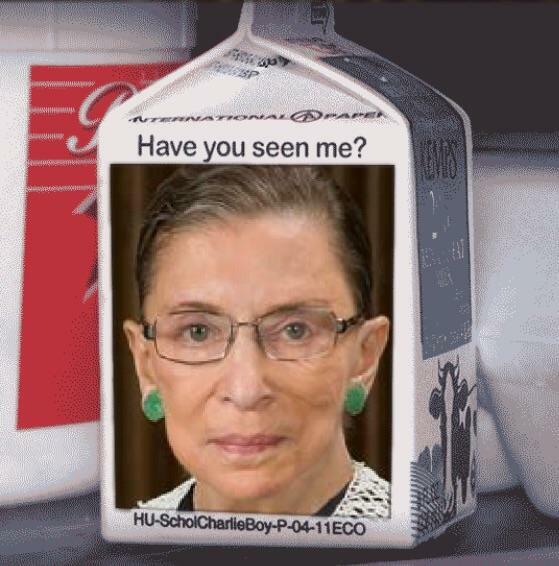 No one has seen her in 59 days, and she is supposed to be working on cases before the Supreme Court. That should be a concern for everyone. If she is unable to make public appearances, than her health must be a greater concern than the media or dims are willing to admit, and if her health is that bad, than she can't be expected to make rational decisions on cases before the court. If that is where we are, then she needs to recuse herself and focus on her health. I disagree. Supposedly Rehnquist was quite sick for some time before he stepped down. The Supreme Court is very much a good old boy (and girl) network and the Justices stick together to maintain their privacy. William Brennan had a minor stroke and it was some time after that when he finally retired at age 90 (and he's still alive at 98). Here's some information on Rehnquist's health status that I copied from his Wikipedia page. There are some parallels perhaps between his case and RBG (and remember Rehnquist was the Chief Justice, which is even more significant than being one of the eight remaining justices). Quote: After Rehnquist's death in 2005, the FBI honored a Freedom of Information Act request detailing the Bureau's background investigation prior to Rehnquist's nomination as chief justice. The files reveal that for a period, Rehnquist had been addicted to Placidyl, a drug widely prescribed for insomnia. Placidyl can be addictive, and it was not until he was hospitalized that doctors learned of the depth of his dependency. Rehnquist was prescribed Placidyl by Dr. Freeman Cary, a physician at the U.S. Capitol, for insomnia and back pain from 1972 through 1981 in doses exceeding the recommended limits. The FBI report concluded, however, that Rehnquist was already taking the drug as early as 1970. By the time he sought treatment, Rehnquist was taking three times the prescribed dose of the drug nightly. On December 27, 1981, Rehnquist entered George Washington University Hospital for treatment of back pain and dependency on Placidyl. There, he underwent a month-long detoxification process. While hospitalized, he had typical withdrawal symptoms, including hallucinations and paranoia. For example, "One doctor said Rehnquist thought he heard voices outside his hospital room plotting against him and had 'bizarre ideas and outrageous thoughts', including imagining 'a CIA plot against him' and seeming to see the design patterns on the hospital curtains change configuration." For several weeks prior to hospitalization, Rehnquist had slurred his words, but there were no indications he was otherwise impaired. Law professor Michael Dorf has observed that "none of the Justices, law clerks or others who served with Rehnquist have so much as hinted that his Placidyl addiction affected his work, beyond its impact on his speech." On October 26, 2004, the Supreme Court press office announced that Rehnquist had recently been diagnosed with anaplastic thyroid cancer. In the summer of 2004, Rehnquist traveled to England to teach a constitutional law class at Tulane University Law School's program abroad. After several months out of the public eye, Rehnquist administered the oath of office to President George W. Bush at his second inauguration on January 20, 2005, despite doubts over whether his health would permit his participation. He arrived using a cane, walked very slowly, and left immediately after the oath itself was administered. After missing 44 oral arguments before the Court in late 2004 and early 2005, Rehnquist appeared on the bench again on March 21, 2005. During his absence, however, he remained involved in the business of the Court, participating in many of the decisions and deliberations. I bolded the last part because that sounds very similar to RBG's case. (02-03-2019 10:31 PM)Fort Bend Owl Wrote: BTW, according to the official word from the Supreme Court, Ginsburg is at home recovering and still weighing in on cases from her home office. I'm not sure how anyone here can complain about that (as long as it is true) because President Trump in a new report spends 60 percent of his days in the White House (since the Midterm Elections) in 'Executive Time' (which is a nice name which means basically spending his time in whatever office or room he feels like where he can watch Fox News or other TV shows, read papers, and make an occasional phone call. The difference between Trump working from home (not in the office) and RBG working from home (as alleged) is we can see images of Trump on TV. 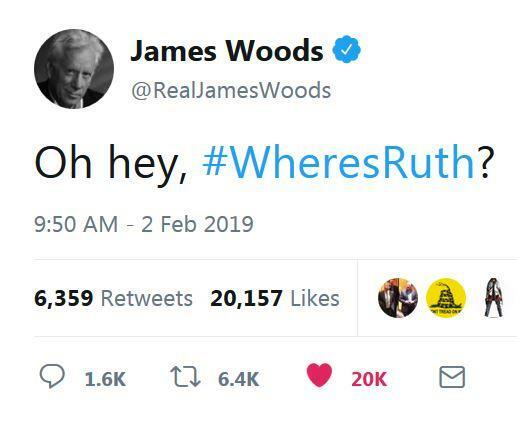 No one has seen RBG since well before Christmas. RBG could erase any concerns about her health by doing an interview (radio or TV), Facebook Live, skype, etc. If she is able to really work from home she should be able to do a quick interview. If she isn't well enough to do a quick interview then it is highly doubtful she is working from home and instead her staff is likely doing her job for her. Her staff was not nominated and approved to serve as a Justice on the SCOTUS.